1. Hallux Limitus - is the term podiatrists, chiropodists and other healthcare professionals use to describe loss of motion in your big toe joint. The metatarsophalangeal, or MTP, joint of your big toe is the structure affected by this health problem. Your first MTP joint is the location where your big toe connects to your first metatarsal bone—a long, thin bone that spans your mid-foot and forefoot. 2. 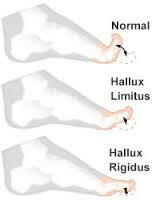 Hallux Rigidus - is considered by many podiatrists to be the end stage of hallux limitus, or a state in which your ability to create motion in your big toe is lost or severely restricted. Hallux rigidus may lead to long-term damage of your first MTP joint, and it usually involves erosion of your joint cartilage and the development of osteoarthritis, or degenerative joint disease. Hallux rigidus is a condition characterized by near-ankylosis, or a state in which your big toe becomes stiff and immobile due to the partial fusion of your involved bones. If you are experiencing hallux limitus or hallux rigidus, Dr. Pisarek can examine your foot to determine which factors are contributing to your challenge, and then use a number of chiropractic techniques, modalities and/or orthotics to lessen pain and improve the function of your foot.